Tensions have been rising in the Kerch Strait, which links the Sea of Azov and the Black Sea, for a few weeks now. Shortly after Ukraine detained a fishing vessel travelling from Crimea in March, Russia increased its military presence in the area and started inspecting all vessels travelling to or from Ukrainian ports, causing days-long delays and disrupting trade. 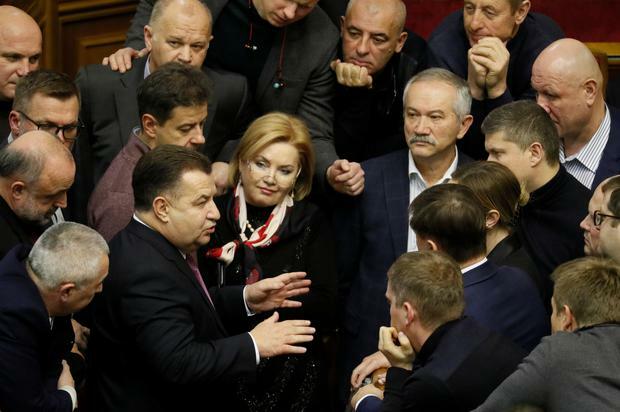 Ukraine has protested against the checks, calling them an "economic blockade". Russia's actions are drawing renewed Western anger - and demonstrating Russian President Vladimir Putin's resolve just days before he meets US President Donald Trump at the Group of 20 summit in Argentina. The roots of the current conflict lie in autumn 2013, when the Ukrainian government was due to sign a deal supposed to open European Union markets for Ukrainian goods and put the country on a pathway to possible EU membership. That endangered Ukraine's ties with Russia, its closest neighbour and major trading partner. The Kremlin vehemently opposed the deal, fearing an uncontrolled flow of goods through what was then virtually an open border. Despite his close ties to Russia, President Viktor Yanukovych publicly pledged to sign the deal - only to walk out on it at the last moment. Massive street protests followed, decrying Mr Yanukovych for what was seen as an attempt to deny Ukrainians a European future. A crackdown by riot police saw 130 people killed in sniper fire. Mr Yanukovych fled the capital to Crimea and was eventually whisked away by Russian special forces to southern Russia. An interim government, made up of the protest leaders, stepped in. Ukraine signed peace accords with the separatists in 2015, calling for a ceasefire and political settlement in the east. While it helped to decrease the intensity of fighting, the accords did nothing to resolve the region's political stalemate. The Istanbul-based patriarchate, whose head Bartholomew I is considered the "first among equals" of Orthodox church leaders, in October made the first step towards recognising the independence of the Ukrainian Orthodox Church. The move was decried by the Russian Orthodox Church as well as the Kremlin. While Sunday's incident - which some call the first overt military confrontation between Russia and Ukraine - raises the spectrum of a full-blown conflict, it is not likely that either side would want an all-out confrontation. By opening fire on the Ukrainian vessels, Moscow reinforced its message that Crimea is Russian for good and that Moscow will not allow anyone to question that. In Ukraine, President Petro Poroshenko is likely to benefit from the martial law that he is proposing. Mr Poroshenko's approval ratings have been in free-fall, and delaying the March presidential elections and playing up the Russian threat could help him get re-elected if the vote is held at a later date.